These are generally fitted to 'Sevens' from 1935 onwards, although are popular as a conversion for the earlier type. Check for wear in the flange bearings,. This can be done by lifting the joint either by hand or using a length of wood suitably supported. Any circumferential movement of the shaft to the flange indicates wear in the bearing joint and this joint will need to be replaced. Having unscrewed the dust cap, pull the sliding joint out of the splines. You will need to carefully clean/remove any paint or dirt from around the circlips/snap rings and the top of the bearing cups. The removal of the older type snap ring is by using a pair of pliers, and prizing with a screwdriver. The later type have a circlip which you will need to use suitable internal piers for this. If the circlip/snap ring does not come out easily then a light tap on the end of the bearing cup should relieve the pressure on the ring. 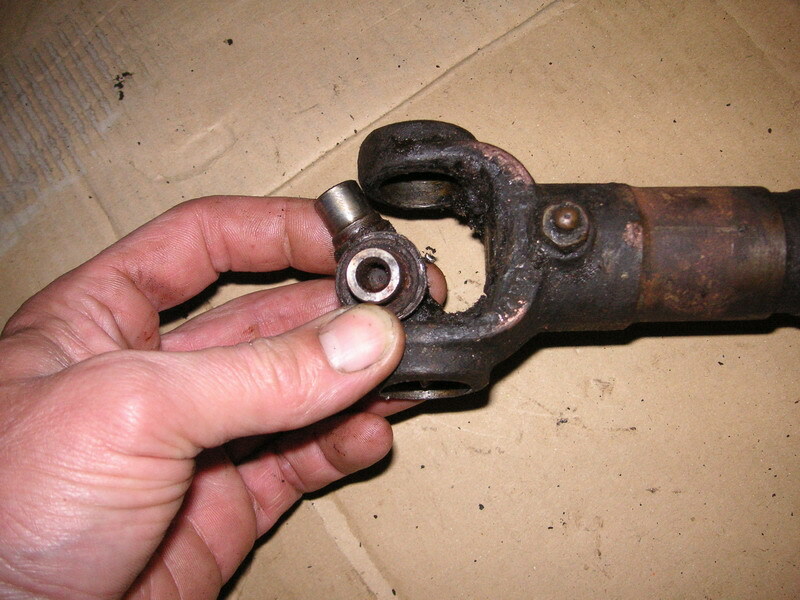 Once all the snap rings/circlips are removed, hold the joint in the left hand with the spline sleeve yoke lug on the top, tap the radius of the yoke lightly with a copper hammer (see photograph). The top bearing cup will start to come out; turn the joint over repeat this until finally the bearing cap can be removed by hand or a pair of pliers. If necessary tap the bearing race from the inside with a small diameter bar, taking care not to damage the bearing bore. Repeat this operation for the opposite bearing. To ensure that the bearing cup bores are not damaged, I refitted the old cup back into each of the yoke, using a small drift, to check that the bearing cup goes completely through the bearing bore smoothly. This way you can ensure that internal surfaces are not damaged when you go to fit the new bearing cups. If the bores are slightly damaged then a careful filing will help or better still you could ream the hole, this will then remove any high spots. 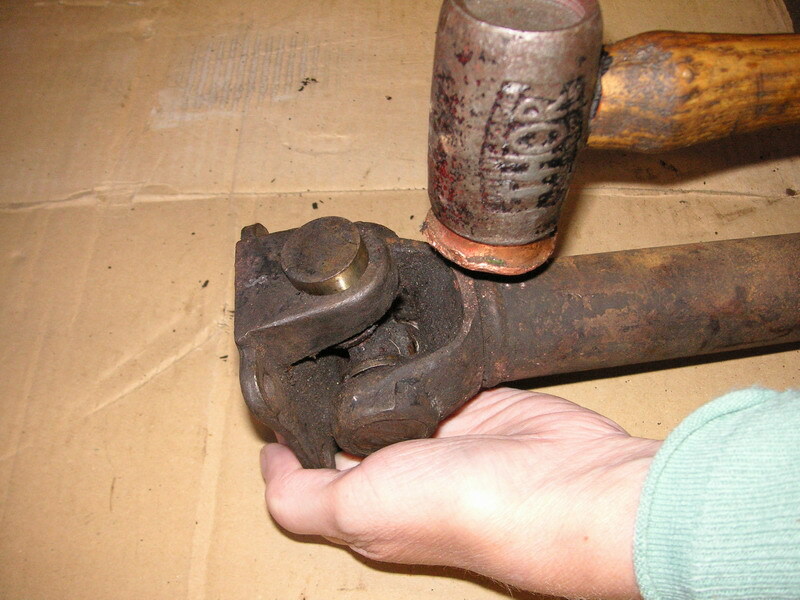 Now the old cups should be able to be gently tapped through; don't be tempted to just fit the new bearing cups, as this could result in the completely assembled joint having tight spots and, even worse, you may have caused damaged the surface of the new spider joint or rollers in the bearing. So be warned; take your time before assembly. I would strongly advise to fit new replacement bearings which come pre-filled with grease instead of using the old ones again. Carefully remove the bearing cups from the new spider joint and ensure that all the very small rollers inside the cup are in place [very important point]. Start by inserting the spider in the flange yoke, push it to one side of the yoke. now using a soft nose drift, ie brass or aluminium, about 1/32" smaller in diameter than that of the hole in the bearing bore, tap the bearing cup carefully into position. Do not use too much force if tight (see cleaning notes above). Then enter the spider joint into the bearing cup as soon as possible, as this prevents the rollers from becoming dislodged. Once again I stress it is essential that the bearing races are a light drive fit in the yoke trunions. Now repeat this operation for the other three bearings. It is recommend that top of the bearing cups should be coated with a varnish /paint prior to just fitting the circlip or snap ring to ensure a good seal. Finally if the joint appears to be tight or bind, this can be relieved by tapping lightly with a soft face hammer. 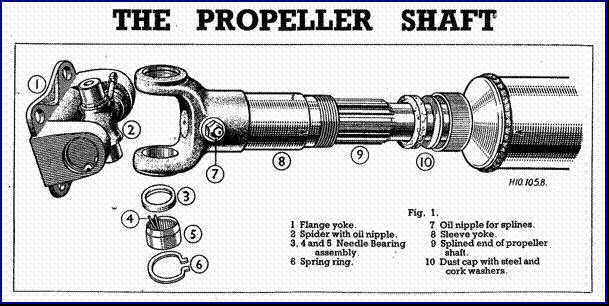 When refitting the sliding joint on the shaft ensure that the trunions on the siding and fixed yokes are in line. Some times there are marks on the spline stub shaft but my experience these have gone. It is advisable to replace the cork washer on the dust cap, if there is one still there. 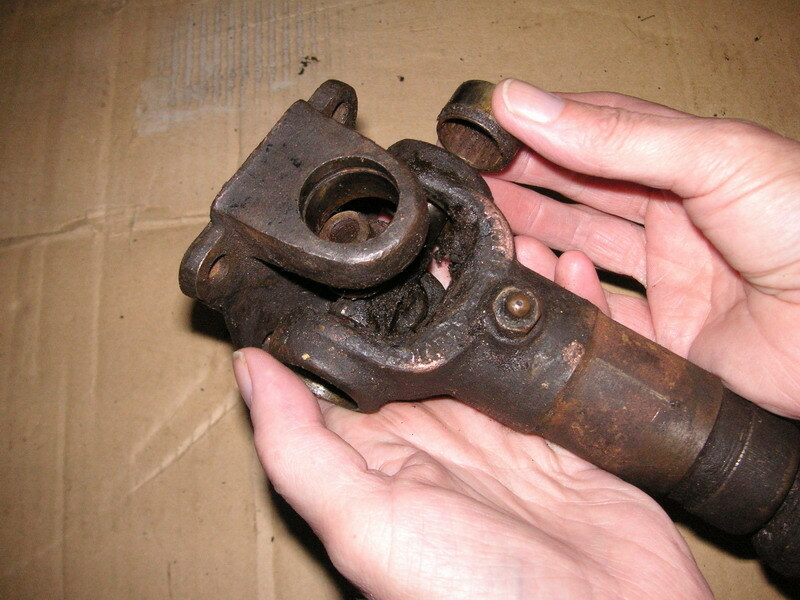 When refitting the complete propeller shaft assembly back into the car wipe the companion flanges clean, to ensure that the pilot flange registers properly and the joint faces bed evenly. insert the bolts all round and are securely locked with either a spring washer or lock nut. Normally the sidling spline joint is placed towards the front of the car. Finally don't forget to grease the spline joint. Then you are ready for another 40,000 miles or 50 years driving. This article, written by Mike Davies, originally appeared in CA7C Seven Focus in May 2007 pp22-24.